The brilliant Kerry Wilkinson of pennydog has included some of my work in her new book. 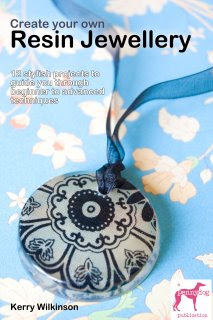 "Create your own Resin Jewellery" is an inspiring step by step guide to making 12 great new resin projects. The e book is available or you can now pre-order a proper paperback to have and hold. So if you've ever fancied trying out resin now is your chance to join in the fun.